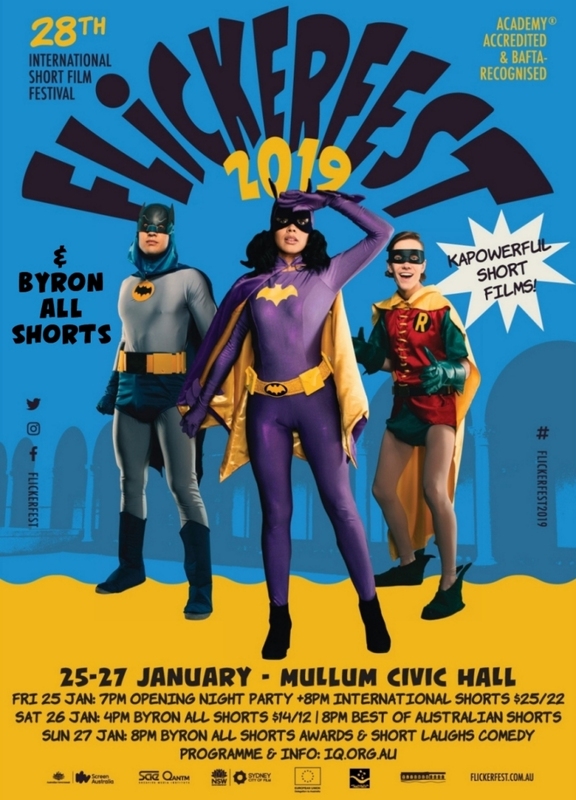 Check out some pics from Mullum Flickerfest & Byron All Shorts 2019 here! View the full programme Mullum Flickerfest & Byron All Shorts 2019 here. Mullum Flickerfest screened to near full houses over the weekend with audiences experiencing the Best of Short films from around Australia & the world; one of these films is Animal Behaviour, which is short-listed for the Oscars®. Audiences enjoyed a 3 day cinematic journey, with a breadth of diversity & highly crafted short films selected from over 2,700 entries & 125 films in competition in Bondi. Returning home to the Best Of Northern Rivers short films with the BYRON ALL SHORTS programme that screened on Saturday 28th January 4pm at the Mullumbimby Civic Hall; alongside Flickerfest’s 3-day programme of the worlds best short films; once again sharing with our enthusiastic and large local audiences the best short films from the region, Australia & the world. Byron All Shorts 2019 saw 15 local finalists from the Northern Rivers region hotly contesting for prizes that recognise excellence in short film making. These amazing & best of local short films screened to a highly receptive & entertained audience at the Mullumbimby Civic Hall, with many finalist filmmakers present to introduce their films to an enthusiastic crowd. BYRON ALL SHORTS 2019 Awards Announced! 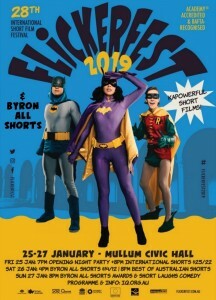 The Byron All Shorts awards were presented on Sunday 27th January prior to Flickerfest’s, Short Laughs Comedy programme. The Byron All Shorts programme was selected from around 50 shorts from all around the Northern Rivers region, with 15 finalists hotly contesting for prizes, that recognise excellence in short film making. A big congratulations to all entrants; & we are proud to provide an important platform for our regions filmmakers. and were awarded certificates & +1 Season Passes to Mullum Flickerfest 2020. Anne Chesher (producer) & Senior Lecturer at SAE Creative Media Institute; legendary Australian actor & activist Tony Barry; & Lisa O’Meara Programs and Operations Manager at Screenworks. Mullum Flickerfest & Byron All Shorts is presented with iQ Inc, & is a fund-raiser for the iQ Arts & Eco Reserve. Thank you! Your support is greatly appreciated & also supports our regions creative industries.